The borough of Weatherly knows what time it is. The borough changed its name in 1848 to honor clockmaker David Weatherly when he agreed to build it a towering timepiece. Sadly, it was an empty promise. Rather than rely on promises, the tiny municipality is taking precise movements to help its economy grow. And the story of the clock still plays a part in it. There is a rich history to the community that includes the lumber industry, railroad, silk mill, brickwork, and candy factory. Add to it the clock tower that was finally built in 1903 by Charles Schwab as part of a new schoolhouse. Couple that history with today’s range of outdoor attractions. At the forefront is a new trail extension that will link the borough to the thriving D&L Trail and the bustling tourist location of Jim Thorpe. To prepare for that 8-mile section, the borough reached out to Technology Clinic at Lafayette College. In its 31st year, Tech Clinic is a two-semester course in which an interdisciplinary team of students works together on imaginative solutions to real-world problems for clients. 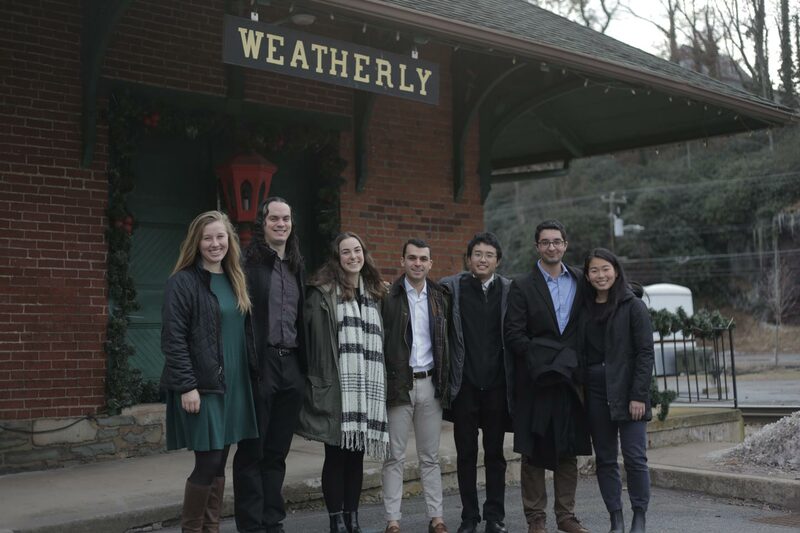 The team of Wassim Gharbi ’19, Addie King ’21, Lauren Phillips-Jackson ’21, Sarah Park ’20, Jon White ’20, Bingsong Zeng ’20, and Samuel McQuillen ’19 under the supervision of Luis Schettino, associate professor of psychology and neuroscience, and Dan Bauer, emeritus professor of anthropology and founding director of the Technology Clinic, used thinking from the Project for Public Spaces to help shape recommendations for Weatherly at its midterm report. Read an article about the project in the Times News. “Do we build a base of people here looking for amenities or do we implement plans for business that will meet tourists’ and residents’ needs?” asks Park. This has been the central question of what comes first, and one of the most challenging obstacles. “Whatever we propose, we want to ensure that the community and seasonal tourists can sustain it,” says White. “More importantly, the plan has to be community-based, not community-placed,” adds McQuillen. By that he means solutions must be ones that work with Weatherly and are adopted by its citizens rather than a generic framework placed onto the borough. Aesthetics: Adding native floral species of flowers and trees in addition to a community garden and public murals could help add vibrance to the borough and celebrate history. The Train Works: Serving as a potential focal point, reshaping this important locale could help activate an important public space. With innovative thinking it could become the location of a children’s museum, farmers’ market, pop-up market, and/or outdoor movie location. Business Accessibility: Discussions with residents helped to identify a few key needs, like a grocery store, diner, bed and breakfast, and improved athletic facilities. Social Media and Website Improvements: If attracting tourists and businesses is a goal as well as improving communication with residents, updating the borough’s website architecture and content could help. So might a more active presence in social media, web searches, and tourism sites. Attracting and Facilitating Business Creation: New businesses might benefit from a survey of available building space. A fishery also may bring in anglers as well as help restaurants with a fresh daily catch. The students know this list is substantial. And time is of the essence as trail construction is already underway. 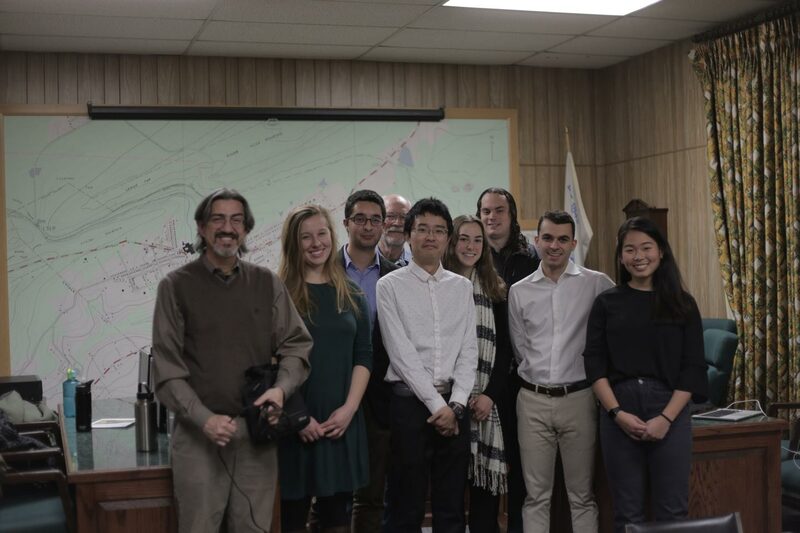 For the second part of their project, students will do just that: share their recommendations with residents, hear the community’s suggestions, and make the recommendations more concrete and actionable. That timepiece has finally come, albeit in a different form.